-Added a critical damage system, players will start with 0% crit chance and it can be increased from npcs and quests. When you crit your damage will turn into critical damage (a new damage type) and the damage will be increased by 50%. You will be able to get more critical damage from future quests and npcs etc. You can see your critical info with the command "!crit". -The passive spell quest for level 200 will now instead reward you with 5% critical chance, people who had already completed the quest has gained the critical chance automatically. The passive spell might be introduced in the future again, it needs some more testing. -Added many new npcs, they sell various permanent buffs to your character for a high price. You can find NPC Elven Lord in the Crystal Wand Quest. You can find NPC Crittus in the demon spawn. You can find NPC Skillmaester inside the 200+ quest room. You can find NPC Pointia inside the Massive Ogre spawn. -You can find a gambling NPC north from the trainers that are next to temple and depot, you can play against him and if you win you will get various permanent buffs. -Stamina now regenerates slighly faster if you are online than if you are offline. -Green stamina now regenerates 1 time per 6 minutes instead of 1 time per 9 minutes, if you are online. -Added bank NPC, he's located in the depot. 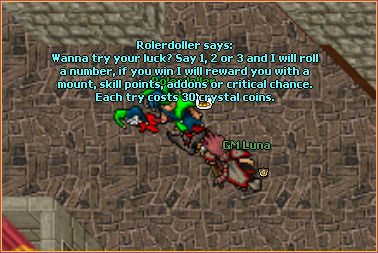 -Added new donation item for 40 premium points, critical hit chance doll, it gives +7% critical hit chance upon use. Everyone who has donated before it was implemented will automatically recieve one for free. All these changes have been implemented and are inside the game right now, tomorrow there'll be some map adjustments, tasks and some changes to spells.